Founded by the Genoese, Ajaccio, Corsica’s capital and the West Coast’s cultural hot spot, is a stylish centre for shopping, fine dining and unhurried aperitifs. To the north, you’ll find picturesque Cargèse, high on a clifftop. A short drive beyond and the stunning Gulf of Porto opens before you, its deep blue water surrounded by red granite cliffs. As a handpicked complement to your holiday, our villa on the West Coast, Moulin des Calanques, is a restored watermill in a breathtakingly lovely location – a taste of Corsica at its most unspoilt and a truly unique holiday experience. West Corsica is home to the Scandola Nature Reserve and Les Calanches de Piana (also known as Les Calanques; acknowledged by UNESCO World Heritage either way): two memorable areas that make this region unique. Catch glimpses of cormorants, ospreys, puffins and the twisting patterns of the coral seabed as you explore the Reserve by boat. Then catch your breath as the dramatic red-granite cliffs and salmon-coloured outcrops of the Calanches change hue in the sun. See this colourful spectacle from sea or land: the narrow, bend-ridden road isn’t for the faint-hearted although its vantage points make the journey worthwhile. Gateway to the Calanches, Piana is a russet-roofed village made even more colourful by its bright geranium displays and a Baroque church with fascinating frescoes. Once celebrated as ‘one of the prettiest villages in France’, Piana nevertheless remains small and relatively quiet. Porto is the busier destination, with supermarkets and cafés vying for your attention alongside the eucalyptus-lined Route de la Marine and the busy marina itself. Most visitors, however, are drawn to the restored Genoese watchtower sitting upon the towering red cliffs nearby, and to the 150 Corsican marine species on display at the Aquarium de la Poudrière. 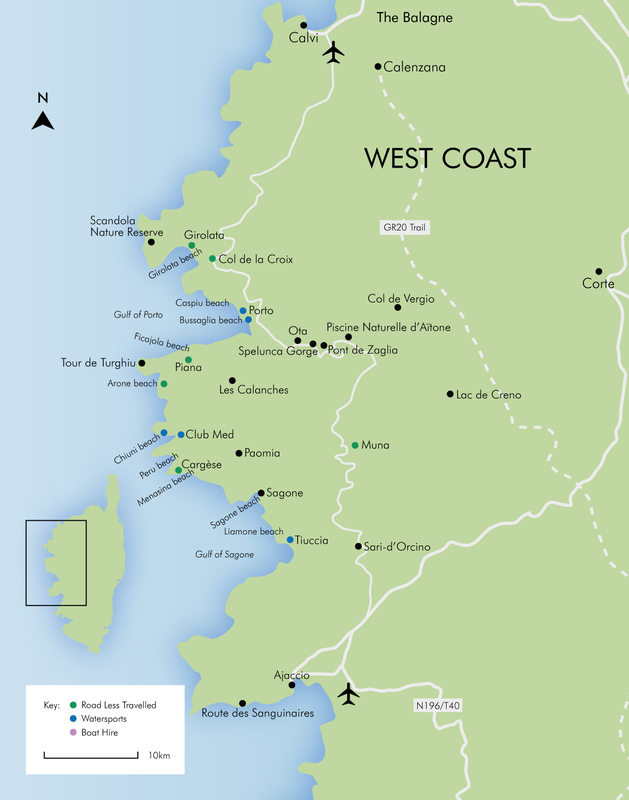 The West Coast also boasts coastal and countryside walks, ranging from gentle rambles to full-day hikes. Perched above a small harbour, the bustling village of Cargèse is a welcoming spot to rest or end the day. Traces of its Hellenic heritage are still visible in the old market hall and Orthodox church, while the three sizeable beaches nearby – Peru, Menasina and Chiuni – are reminiscent of the best from the Greek islands. These sandy stretches are perfect for sundowners as you admire a dazzling red-hued horizon – although, as you might expect, the entire West Coast is famed for its sunsets. The capital of Corsica, Ajaccio is sometimes called La Cité Impériale (Imperial City) in honour of its most famous son: Napoléon Bonaparte. Statues adorn public buildings and pretty squares and his birthplace is open to the public too. The town’s pastel-shaded edifices shelter smart boutiques and busy cafés oozing a definitively French air of sophistication. Browse and shop in the farmers’ and fish markets, the Rue Cardinal Fesch – a narrow backstreet – and the parallel Cours Napoléon. A boat trip from the old port to the Blood Islands (Les Iles Sanguinaires) offers the promise of a vivid red sunset. Perhaps the most beautiful forest in Corsica, the Forêt d’Aïtone, has a canopy of beech, fir, larch and laricio pine that soar up to 50 metres. There are plenty of walking paths (some offering great views over the Spelunca Gorge) and it’s easy to find a suitable spot for a packed lunch. For an alternative form of refreshment, swim in the Piscine Naturelle d’Aïtone – a natural rock pool that’s popular in the summer. The forest ends at the high point (almost 1,500m) of Col de Vergio, where a snack bar serves delicious specialities of the area. If you like seafood, try fish soup with grated cheese and rouille (a spicy mayonnaise), langouste (crayfish) and whatever’s selected as the catch of the day. For authentic Corsican food, go to a ‘ferme auberge’ restaurant, which is obliged to serve 70% of home or very locally grown produce. The chefs will probably use ingredients defined by the maquis – the dense shrubland covering the island’s rugged interior – plus chestnuts from the local trees. The nuts are simmered in stews, made into unctuous sweet spreads and preserves, and used to create a smoky-flavoured flour that enhances everything from bread to beer. At weekly food markets and roadside shops, look for the symbol of indigenous cuisine – a Moor’s head wearing a bandana – and the artisan-produced ‘Produits Corse’. The island’s recently-gained reputation for fine wine stems from the vineyards of Ajaccio, Clos Canarelli, Fior di Lecci, Patrimonio, Sartène and Torraccia. While pastis remains the ubiquitous apéritif, eau de vie de myrte is a local digestif that’s macerated with sugar and myrtle berries. Pietra is the local beer. Cargèse has a couple of excellent beach restaurants where, unsurprisingly, fish and seafood are the specialities. For finer dining – and the chance to experience the spectacular views from its terrace (see the next section) – try the romantic fin-de-siècle dining room of the Hôtel Les Roches Rouges at Piana or the gastronomic restaurant at Plage d’Arone. Less elegant but just as mouth-watering, most of the other restaurants in Piana village serve traditional Corsican food and provide an authentic island-dining experience. Porto is worth exploring for lunch options in particular, with plenty of places tucked away in the cobbled streets overlooking the port. And wherever you go in Corsica, look out for signs saying Pizza au feu de bois (woodfired pizza) and delight in crisp, baked bases served with a carafe of ice-cold rosé. The only sandy beach in this region, the crescent-shaped Plage d’Arone is bordered by spearmint-green water, mountains and the maquis. Three restaurants – one a gastronomic highlight – add to the attraction. Turn right off the D81 onto the D824, just past the souvenir shop and the church. The drive to the beach twists and turns, so allow 20-30 minutes. Sitting below Piana, this gorgeous little cove was once shelter for lobster fishing boats. Nowadays, it’s frequented by pleasure-craft and day-trippers. There’s a snack bar in high summer. It’s a 10-minute drive from the villa, signposted off the D824, then 15-minutes on foot to the beach. The D824 is a steep road full of hairpin bends, making your journey to the beach a little more exciting! This pebble beach boasts a mountain backdrop and super-clear water that’s ideal for snorkelling. Its three restaurants – one with pedalos, canoes and sunbeds for hire – also draw people in. Take the D81 north out of Porto. After 5km, turn left onto the D724 – signposted Bussaglia (Plage). You’ll drive alongside a dried-up riverbed before arriving at the beach. A shingle beach below Partinello village with good snorkelling and two simple restaurants. Take the D81 north out of Porto, arriving in Partinello after 13km. Turn left onto the D324, signposted Caspiu (Plage). You can walk the pleasant (but unmarked) coastal path from here to Plage de Gradelle. It takes about two hours, there and back. This very long stretch of sand has a completely natural setting of dunes and vegetation that combine to partially hide it. The beach is 2km south of Sagone and you can park your car on the roadside. The Liamone River flows into the sea in the middle of the beach. In the summer, the small part of the river by the bridge is used for windsurfing lessons. Lapped by turquoise water, Cargèse’s main beach features two bars in the middle of its sandy stretch and a seafood restaurant at the far northern end. From the northern intersection of Cargèse (by Le Saint Jean restaurant), follow the road to the restaurant Ta Kladia. To reach the middle of the beach from Ta Kladia, go to the small intersection along the road and turn left – through the open barrier – onto the little track. This town’s known for culture as well as the couture of its boutiques. The Musée Fesch houses artwork by Italian masters including Botticelli, Titian and Veronese – the largest collection of such work in France, after that of the Louvre. Just above Cargèse, Paomia is a pretty stone hamlet with ancient remains and spectacular views: the settling place for the Greeks fleeing Ottoman rule. Before your visit, pick up your picnic provisions at Cargèse’s old, Greek-style covered market. This dramatic, red-granite gorge is best explored on foot from the attractive village of Ota. The path leads to the Pont de Zaglia, an 18th-century bridge in a leafy setting that compels you to take a refreshing swim. The green surrounds of Sagone offer glimpses of sleepy hilltop villages, olive groves, fruit trees and vineyards. Some grapes grow alongside the Liscia at the Clos d’Alzeto winery in Sari-d’Orcino – the highest vineyard in Corsica. Ignoring the organised trips, you can rent your own craft (although you may need a power boat licence). Also, Cargèse’s Club Med rents jet skis and pedalos, and there are kayaks in Tiuccia. Or, try scuba diving at one of the two centres in Porto. There are over 50 flavours of excellent ice cream and sorbets – including savoury – at the famous parlour in Sagone, around 40 minutes from Piana. The master glacier creates unique tastes, adored by top chefs, gourmands and the general public alike. Overlooking Calvi’s sophisticated harbour and red-tiled rooftops (hiding lively bars and restaurants), the narrow streets of the Citadel lead up to an impressive cathedral. Crowds flock here for annual art and music festivals. It’s 2.5 hours away by road each way. This Genoese tower sits at the 331m-high apex of the Capu Rossu, the red peninsula lying south of the Gulf of Porto. Walking up from the D824 and back takes 3.5 hours, but the views from the top – out to sea and inland – make it all worthwhile. A laricio pine forest surrounds this attractive and tranquil mountain lake, which is only accessible on foot (a 3-hour round trip from the car park above Soccia). In spring, you’ll see its glassy surface festooned with pink-purple water lilies. Whit Monday. A public holiday on the first Monday after Pentecost (50 days after Easter). Les Estivales. Concerts by Corsican artists in Porto and surrounding areas. Festival de Pyrotéchnie, Porto. Bastille Day fireworks on the Genoese watchtower. The Assumption of Mary is celebrated with a big firework display in Cargèse and Ajaccio. This year, for the first time, Piana will also have a display – look out for the signs. A short drive from the villa, the Hôtel Les Roches Rouges in Piana perches on a hillside overlooking the red rocks of Porto and Les Calanches. Go at sunset for cocktails on the terrace – the food’s good too – and the extraordinary views. Entering the hotel is like stepping back in time and it’s easy to imagine yourself in an Agatha Christie novel or film adaptation: very special. Reached via vertiginous roads, Muna is a semi-abandoned mountainside village offering an insight into traditional Corsican life and extensive vistas of the island today. The majority of the stone houses stand empty, although a few nostalgic heirs are restoring their family’s old properties. It’s worth visiting the church, although you should avoid any temptation to ring the bells; they’re used as a fire alarm. As well as being one of the most beautiful sandy beaches in Corsica, the Plage d’Arone also offers culinary delights in generous portions. However, to get to the beachside seafood restaurant, you must first negotiate a winding road that can take 20-30 minutes – making the brochettes of huge prawns, grilled over a wood fire, even more delicious. While a Catholic church is not unusual in France, it’s more curious to see a Greek Orthodox church – especially just opposite. Built by descendants of the Greeks who fled Ottoman rule in 1663, and decorated with rich icons and paintings, the church marks the final act of integration for the immigrant population. Nowadays, congregations from both churches join in a colourful Easter parade. On a boat trip to Scandola, you might have lunch at one of the restaurants in the pretty seaside hamlet of Girolata. However, it’s less touristy if you walk the relatively easy three-hour round-trip from Col de la Croix and then reward yourself with a swim on Girolata’s beach before eating. Make sure you book a table in advance during the peak summer season.